If…the idea of using cordless tool batteries to power an ebike has ever crossed your mind? You are not alone. After some research, I found out that…it is not as crazy as it might sound. First of all, I have known for a long time that the 18650-format cells that are in cordless tools (18650 = 18mm diameter, 65mm long), are the premium cells that you would want for making an ebike battery pack. Its true that laptop computers also use 18650-format cells, but…those are low-amp cells that compete on lowest price, not high-performance or long run-time. Just four years ago, pioneer ebike hot-rodders like Doctor Bass had to buy and gut cordless tool packs to get high-performance cells (now, there are hot-rod packs from many suppliers, like Luna Cycle). So…this leads to a question. Which cordless tool packs can power an ebike? This isn’t a crazy question. International trade conflicts mean that at any moment, products from China can become a temporary casualty of a trade war (there is currently a trade deficit, meaning the US buys more from China, than China buys from the US). Trust me, all ebike products have some component that comes from China. If there is a trade war, there will still be tens of thousands of cordless tool battery packs that are still in US warehouses. They will be waiting to be bought by construction contractors, but…if some of them are appropriate for our ebikes, right when you need one most? this article will try to help you identify which one are worth going out of your way to snap them up, before anybody else gets them. If we agree on a low voltage of 3.3V per cell for common 18650 chemistries (3.3V for long pack life, as opposed to a more common 3.0V per cell), then…a 10S and 14S battery pack would have an LVC of 33.0V and 46V…respectively, (commonly called 36V and 52V batteries). Ebike battery packs made from lithium 18650 cells are considered fully-charged to 100% when they are at 4.2V per cell, so…a nominal 36V / 10S battery pack will have a top-voltage of 10S X 4.2V = 42V, and a 52V / 14S pack will have a top-voltage of 14S X 4.2V = 58.8V. The cordless tool battery packs we are interested in have a top-voltage of 10S / 42V…and 14S / 58.8V, commonly called 36V and 52V. This is a typical lithium-Ion battery discharge chart. If you respect our opinion on this? Only charge your lithium battery pack up to 4.1V per cell. It will double the life of you expensive battery pack, as opposed to the commonly-used 4.2V per cell. So…where does this lead us?…if you are happy with 36V (10S) and 52V (14S), then…you DO have some cordless tool options for your ebike. 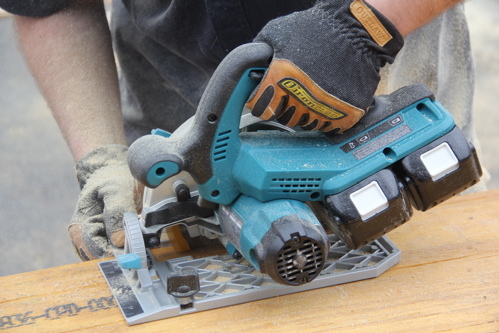 It is possible to get 36V (10S) from connecting two 18V (5S) cordless tool packs in series (in fact, several manufacturers do this for some of their tools like Ryobi, Makita, Black and Decker, along with Greenworks). I don’t think this will ever catch on for ebikers, and the only 36V / 10S packs that “might” find a few EV users will have a full 36V / 10S voltage in one single pack (plus one single charger, instead of two 18V chargers). Powered skateboards are growing in popularity. I am amazed that nobody has built them to accept cordless tool packs yet. Shipping lithium is a hassle with tons of liability, and cordless drill packs can be found in any major cities’ hardware stores. If you are interested in getting 36V by connecting two 18V battery packs in series, seriously consider the Milwaukee 18V / 9.0-Ah packs. In fact…if you are happy with 36V and 9.0-Ah…this would be my preferred battery pack, since the largest single 36V pack listed below is 6.0-Ah. I don’t list anything from Ridgid, Skil, Festool, or Hitachi in the text below. Their lithium batteries do exist, but I haven’t found any worth mentioning for this type of application. Metabo and Hilti brands are high-quality and heavy-duty, but their batteries are only 18-volt and low-Ah, not to mention very expensive. It’s my understanding that Milwaukee has purchased Ryobi and Ridgid brand names. It has been speculated that Ridgid is now their “affordable” brand, Ryobi is marketed as the mid-range home-owner “light duty” brand, and Milwaukee is advertised as their serious heavy-duty and high-quality contractor “use all day” brand. The Bosch packs should be on the short-list for consideration, if you want 36V, or…72V with two packs in series. Be aware, there are many 10S cordless tool battery packs (ten lithium-ion cells connected in series), that the manufacturer is calling a “40V” pack. Rest assured that all of the packs listed in this section are the same voltage, whether they are called 36V or 40V. Ryobi products are typically found in Home Depot hardware stores. Their 40V line has a 2.4-Ah size of pack, a 4,0-Ah, and also a 40V 5.0-Ah…part number OP4050A. The Stihl brand is very well-known as a serious gasoline-powered gardening tool maker, like chainsaws. Their 36V AP-300 is a serious 6.0-Ah. In this video below, the smaller AP-180 is shown “opened up” for a few seconds, showing that is has 30 cells in a 10S / 3P configuration. 3P providing 6.0-Ah means each cell is a 2000-mAh, which suggests that they are likely the highest amp-producing cells available, and…that explains why Stihl is getting chainsaw-levels of power from only 36V, the Stihl tools use very high amps. The DeWalt 40V DCB404 is only 4-Ah (somewhat small), BUT!…the DeWalt 40V DCB406 is 6.0-Ah. I saved the best for last, and if you really want to use a 36V battery pack for an electric bike? seriously consider the Bosch 36V packs. Not only is Bosch a very large global brand that has a reputation for using quality components, they are the only 36V pack that uses air-cooling. In our article on making lithium batteries last as long as possible, one of the key elements was preventing them from getting too hot. I’ve only found two brands that have this air-cooling feature, Bosch and EGO. The Bosch charger definitely blows air through the battery pack when it is charging. I haven’t found proof yet that it gets powered air-flow when you are running the tool, but…their engineers are nuts if they didn’t do that. But…even if they don’t...the Bosch 36V / 10S pack system has a 6.0-Ah option for their mower, so…it’s at least as good as the other options above. If the 6.0-Ah pack is fan-cooled when it’s running, then it is the clear winner. At he very least, it’s construction allows an ebiker to add a fan to it, and the others do not. If you Google 36V and 40V battery packs…you will also come across the off-brand names Enegitech, Earthwise, Lynxx, Sun Joe, Oregon, and others. I have no experience with these, but I suspect they use some pretty generic cells with a cheap BMS and a cheap charger, so I don’t recommend them. If you try them out, please post about them on the internet (and send me a link), whether the results are good or bad. Hilti makes a rock-solid 36V / 6.0-Ah pack made from only the highest quality components with a bomb-proof warranty, but…did I mention? Its over $420 for only one of them without the charger…yeah. I had really hoped I would find at least one cordless tool lithium battery pack that used 48V (13 cells in series, 13S). The few 48V devices I found (lawn mowers, etc), turned out to use lead-acid batteries. If you find any, please send me a link. However, mid-drives such as the popular Bafang BBS02 and BBSHD typically only draw 25A-30A when using the stock controllers. Their controllers will also run off of a 48V pack or a 52V pack. There are several selections listed here that will easily provide 52V and 30A. There are even small geared hubmotors that would be happy with 52V / 30A, without straining the battery packs. Some ebike 14S pack sellers call their packs 50V, and others call them 52V, but…if they use lithium-ion cells? They are all the same exact voltage. That would be 50.4V nominal up to 58.8V when fully charged. The internationally-recognized standard for DC voltage to penetrate dry skin is 60V. The starting voltage of these 14S packs just barely misses that, but…after only a few moments of run time, the pack will settle into the long “nominal” voltage portion of the discharge that is near a much safer 52V. The Worx brand weed trimmer is listed as 56V, but it appears to be physically identical to the Echo 58V. There are teardown videos of the Echo battery (see below), but I haven’t found video of the Worx pack interior to verify my theory that they are the same. These Echo packs are called 58V, but they are definitely 14S, so…they have the same voltage as the other packs in this section regardless of the voltage in the name. The Echo engineers wanted their packs to be as compact as possible, so they are mounted in a tight cube. That does make the pack small, but…it also restricts airflow through the pack, making the cells in the center of it warmer than the cells at the edges. Heat is bad, and it is very beneficial if you can avoid that as much as possible. It doesn’t matter how long the cells around the edge survive, if the cells in the center die an early death, the whole pack immediately becomes trash, amirite? The largest Echo 58V pack is a modest 4.0-Ah, and this is another way in which their weed trimmer is kept to a very light weight, but…it also hurts the mowers run-time (they both use the same pack, with the mower using two of them, and the weed trimmer using only one). However, there are options, so…keep on reading below! Buckle-up, because this section is going to be an earful. Fair warning, I am a huge fan of the EGO batteries. In the interests of full disclosure, I have never received anything for free from EGO, and I paid the full retail price for their weed trimmer and lawn mower, both purchased at Home Depot. The EGO 4.0-Ah pack for my trimmer, and the monster 7.5-Ah pack for the mower (they also carry 2.5-Ah and 5.0-Ah packs). The banana-for-scale is calibrated in 4-inches and 10-centimeters. Not only does EGO use high-quality name-brand cells, they have done four specific things to keep the cells as cool as possible, which is why the EGO packs should last much longer than the other brands. Each cell has a PCM sleeve to absorb heat-spikes. PCM is a “Phase Change Material“, and the All-Cell company is famous for inserting their cells into a large block of PCM to help manage battery heat. With this type of PCM, it doesn’t change from a solid to a liquid, it’s more like changing from a hard rubber to a soft rubber, when the cell gets hot. During that process, it can actually absorb a surprising amount of heat. The heat still has to be dissipated over time, but this simple addition limits the highest portion of the working cell temperature peaks. Speaking of dissipating that stored heat that was absorbed by the PCM sleeves, these packs have an unusual shape that spreads the cells out, instead of bunching them up in a block. This helps air-circulation, which is vital for the next feature…air-fan cooling! These packs from EGO are not sealed, they have channels that allow fans to blow air through the packs when they are being used, and also when they are being charged. The last feature that helps these stay as cool as they can be…is their size. The EGO mower does have an UN-exciting 5.0-Ah pack available, but I opted for the 7.5-Ah, which is the largest cordless tool battery pack I have found (other than the backpack batteries listed farther below). A 7.5-Ah is not only the best range of a cordless pack, it’s size means that each individual cell is less stressed, and will run cooler than it would if you were pulling the same amps from a smaller pack. Since these EGO packs require an open architecture to allow for the awesome fan-cooling feature, the electronics are all fully potted in epoxy against rain and accidental splashing. I’m sure the various brands of mowers and weed trimmers have a performance that all work about the same, but…it was the batteries that made me a fan of the EGO brand. I now own the EGO mower, trimmer, and leaf-blower… and I can verify that they are pretty damn great. I don’t need earplugs like I did with the loud gasoline mower, and it is quiet enough that I can get up early in the summer to mow, instead of waiting until later when it gets hot…and I used to do that so I didn’t wake up my neighbors who are trying to sleep-in on a Saturday. One other great feature is that I own two 52V ebikes, and…when they get to being several years old? their capacity will eventually erode down to 14-Ah from the original 17-Ah (as all batteries do, regardless of manufacturer). When that happens I will buy a new 52V battery pack for my ebike, and the old pack can be used for the mower until it is completely dead. At a well-worn 14-Ah, my old ebike pack will still be almost twice the capacity of the stock 7.5-Ah EGO pack when that one was new. Here’s another wrinkle. In a power outage, how many batteries do you have that can keep your smart-phone, re-chargable flashlight, and laptop computer charged for as long as possible? I have a small DC/DC converter that takes the 52V and produces 12V for my ebikes lights and radio. That 12V socket can also keep my phone, 18650-cell flashlight, and laptop charged up for a very long time, by using my 52V ebike batteries…and…my EGO lawn mower batteries! One last note, the large 7.5-Ah pack will not only run the mower for which it is designed, it will also run the string-trimmer, which of course would make the trimmer a little tail-heavy. The smaller 4.0-Ah pack WILL NOT run the larger mower, and there is some voodoo involved by EGO to prevent you trying that. Both chargers will charge either pack, but…only the charger for the 7.5-Ah pack has four LEDs to show the state of charge. The smaller charge only has a “finished charging” LED. I was so disappointed years ago when I tried out an 18V string trimmer. Others have come and gone (24V, 36V), but…this was the first time I was willing to give it another try, and I am VERY satisfied. I charge them to 75% immediately after mowing (three LEDs out of four), and then I only charge to 100% just before mowing. If you store lithium-ion battery packs at 100% charge, they will die much sooner than necessary. Store them at 90% or less, in accordance with the information we researched, found here. Doing this can double the life of your expensive packs! Here’s another article on the EGO 56V batteries by one of my favorite writers, Karl. It’s from a year ago in April 2016, and this article convinced me to actually buy an EGO 56V weed trimmer, instead of just reading about them. Every major cordless tool manufacturer on the planet has a variety of 18V tools, which use five cells in series (5S). DeWalt created a clever 20V / 60V pack with 15 cells inside. The interface is made so that…when it is plugged into a 20V tool, the pack is automatically configured as a 5S / 3P pack…with a VERY long run-time. However, when you want to use that battery pack on a more powerful 60V tool, you just plug it in, and the tool interface will automatically configure the pack as a 15S / 1P pack. High power, but with a short run time. I know of one builder who is using these on his BBS02 ebike, and I wrote about it back in January of 2017. If 15S interests you, the Snapper brand “might be” a better bet. It has a 15S / 2P pack that is definitely 30 cells at 4-Ah (with no fancy 20V / 60V switching like the DeWalt). However, even at 2P, it does not have very much range, so you will have to add several of them, just like Blain’s BBS02 / DeWalt cruiser listed just above. I couldn’t find any battery pack teardown videos for these, but it uses TWO small 60V / 2.0-Ah packs to get a decent run-time from the mower (instead of one large 60V pack). The weed trimmer only needs one of these 60V packs at a pretty small 2.0-Ah. B&D is still selling 36V lead-acid mowers, so its no surprise that their new lithium mowers use an existing system (rather than invest in a risky new-to-them format)…yup, the dual small 60V packs look identical to the Greenworks packs listed above. Each brand of mower does have differences in their features, but…both of them look like they use the same battery system. There is no word on whether both of them use the same 18650 cell, or what that cell-brand and chemistry that they might be. Both use small 2.0-Ah packs…If you have info and tear-down pics…email me! I don’t recommend these for ebike experiments. Not only is the higher voltage un-necessarily more dangerous, but…if you truly want to run 20S, I feel it would be easier to adapt using two large 10S / 36V packs in series. That being said, they do exist. The Snapper brand has an “82V” series (with a respectable 4.0-Ah size) that is made in partnership with Briggs and Stratton. B&S is no stranger to electric motors, and their ETEK motor is an ebike hot-rodders favorite…found in floor scrubbers and lawn mowers. The Greenworks brand has an 80V mower, and the larger 4.0-Ah pack looks identical to the Snapper packs listed above. They also have a smaller mower that uses two 80V / 2.0-Ah packs, instead of one large pack. No matter what size and type of cordless pack you decide you want to use, you will have to make mounting adapters for each pack. In the video tutorial above (for Blairs DeWalt Cruiser), he cut the bottoms off of six DeWalt worklights, since they were the least expensive DeWalt tool that had the slide-in interface for the batteries. Some builders have the tools and skills to make mounting adapters from scratch, but I believe most cordless battery ebike users will have to allocate some of their budget to buy a cheap tool to sacrifice (or buy a used tool at a pawn shop, or from ebay?). Also, save the lights you cut off, they can still be used! three of the 20V lights “in series” can use the 60V battery pack voltage directly without a converter. Cordless tool manufacturers want contractors to use more cordless electric tools, but its been a slow climb for them. I may only spend 30 minutes mowing and trimming my lawn and bushes, but…someone who does that for a living will go from lawn to lawn all day long. The only way I could see me using cordless electric lawn tools for a business is if I used the cordless electrics early in the day, in a neighborhood where the gassers are too noisy to use before 8:00-ish. After 8:00? I’d switch back to gasoline. Husqvarna and Stihl both have large 36V backpack batteries. Husky makes a couple of sizes of backpacks in 36V. The BLi520X is 14.4-Ah and retails at $600…and the BLi940X is 26.1-Ah and $950. These two guys (Husky and Stihl) seem to constantly compete with each other, so of course Stihl also has 36V backpacks. The AR900 is 24-Ah, and costs $850, and the AR3000 is the largest one at 31-Ah, selling for $900. However, if you are running two or three packs IN PARALLEL (in order to have a longer range without needing to occasionally swap from one pack to another), you absolutely MUST charge and discharge them all at the same time, and when you insert them into the mounting harness…if one of them has a lower voltage than the others? all the packs will rapidly equalize. This means a LOT of heat, possibly damage to one of them, but whats worse? It can cause a fire. This is no joke. If you have two mounted packs (or more) and you install a switch to move your ebike power from one pack to the other (instead of physically pulling one pack out of a mounting slot and sliding a second pack into it), make sure that the type of switch you use has a neutral center position where nothing is powered. I have mentioned a few times that there are some situations where putting two packs in series would be beneficial. For instance, two 36V packs in series would result in a 72V pack, and two 24V = 48V. However, there is a failure mode for the integrated BMS’s on some packs where it would be beneficial to add a diode per pack. Here is the electrical schematic, thanks to ES guru and electronics enthusiast Richard Fechter. An electrical schematic for adding a diode per pack, for joining several battery packs in series. LOL! I just found out that Makita Is making a Makita branded ebike. It is a small aluminum folder, that uses two 18V packs “in series” for 36V to run a geared hubmotor. Since it drives a small-diameter wheel, I think this would actually work well. Maybe not good for large potholes on a fast street, but, it would climb well on a fairly smooth street. Folders don’t get a lot of respect, but…if you want a stowable ebike to put on a boat, an RV, or a plane, this is the one to get! Here’s a other video, and this one’s in English. Stick with a large global retailer of well-known “heavy-duty contractor-grade” tool batteries, like Bosch, EGO, Milwaukee, DeWalt, Makita, etc. Use a voltage that fits right in with a common ebike controller voltages, like 36V or 52V. Do NOT alter the batteries themselves, so technically you might be able to use the factory warranty if you get a defective unit. The on-board BMS’s and temperature sensors will not allow you to draw more amps than they can safely provide, so they should last a very long time…even on an ebike. Fan-cooling the interior of the packs is a HUGE benefit, so I would encourage anyone to make every effort to find a way to get the 56V EGO or 36V Bosch packs work for your application. Wow nice article, I wish Luna would sell adapters so we could just go to Lowes and buy a bunch of drill batteries and drive off on our awesome ebikes. You could do the design work (3D CAD) and then 3D print some adapters to accomplish what you want to do. Great article Ron. I’ve been using the Ego products for almost 3 years now. I’ve had one quick charger die, but the battery and mower and trimmer and chainsaw are all working well. I can’t say enough good things about them. Make sure to register the products online so you can get the full 3 year warranty on the battery and charger. Running these packs in parallel is a poor idea, just bring them along and swap them out as they die from one to the next. Much safer. Love this Backpack batteries. If only they could make them in 52V formats ! A very informative read, thanks. I’m looking at the ‘Husqvarna BLi300 36v Battery 9.4Ah’ – which seems very nice for an ebike set up. It has a cheap wired charger too (along with a cradle-type option) – this would make it useful to buy two and use the socket from one as an ‘onboard’ connecter of the battery through to the motor. Any thoughts? Black and Decker Batteries are by far the cheapest power tool battery. Was wondering about the wiring portion on Milwaukee batteries. There four prongs does anyone know the diagram and how to wire in series? Thnx! Great articled – thanks. Been trying to ‘hack’ 40V Ryobi packs. These smart packs with 4 terminals cannot be used by simply connecting to the + and – terminals. Any idea on how to switch the pack on????? likely something to do with the other two terminals T1 and T2 ????? Not sure if this applies to the 40v pack, but on the one+ 18v. lion packs, there is a small sense voltage present, not the main battery voltage. The pack apparently “turns on” when a certain level of current is drawn. I was converting an old ryobi flashlight to LED using a backup light bulb. It would not turn on reliably. I had to add a small capacitor (about 100uf) to draw the initial current to turn on the pack, plus a small resistor (5 kohm) to bleed off the charge in the capacitor between uses, so it would start up again next time. You might need to do something similar. Probably your controller has the capacitors, but you could try adding a resistor in parallel to provide a steady load across the controller power inputs. Try a 1000 ohm 10 watt resistor from parts-express.com or digikey. Also not sure about T1 and T2, but suspect they may be temp sensor to hold off the charger if pack is too hot. what is the bms limited current from a dua volt Dewalt battery? HOW DO I KEEP THE BATTERY MANAGEMENT BOARD FROM DISCHARGING THE PACK TOO MUCH? MILWAUKEE’S 18V 9AH PACKS WHEN RAN IN PARALLEL & SERIES ALLOW THE PACKS TO COMPLETELY DISCHARGE & WILL NOT CHARGE BACK UP! Great article. I would like to use Ego 56V as it looks great, but what tool can you sacrifice as all their products look rather expensive. When I priced out batteries for a bike, the option of using tool batteries turned out the most expensive ($/WH) of all. Add to that the work of rigging up mounts and it seems getting a dedicated ebike battery from a reputable supplier is a better value. If you happen to have tool batteries anyway though, I suppose it would be handy to use them as much as possible since batteries are continually getting cheaper and better, so by the time they wear out better performing batteries will be on the market anyway. Echo 58v x 4ah = 232 watt-hours. Ebay has good ones for $68, even including a $26 charger, that is $94/232wH = 40 cents per watt-hour. Without a charger, that’s the best deal around. Greenworks 60v x 4ah = 240 watt-hours. I get them on ebay for $96 and I have a 60v charger already. At 40 cents/wH, that’s a little competitive with Echo but you get more voltage/horsepower with Greenworks. Just plan to avoid overvoltages using a Bafang system. Ego 56v 7aH or Ego 56v 5aH both come in at 57 cents per watt-hour using ebay seller prices. These are the ones spinning magnet is recommending for good reason. Another plus, is that Ego battery holder mounts for ebikes are available for under $20 on ebay. RIgging up mounts are much easier now. Last but certainly not least, Luna is a building high-quality batteries and its 52v 6aH Mighty Mini is slightly less than $1/watt-hour. A good deal considering the known quality of a smaller company with a clear focus on ebikes and loyal customer base. I’m basically stuck with Echo and Greenworks batteries for the time being but I’m thinking when time comes to recycle the old, I’ll definitely be looking at some Ego 56v 7aH, or the Luna Mighty Mini 52v. I want to build an ebike using the Bosch 36V battery. Does anyone know where I can buy a mount / plug for the battery, so that I can mount it to my bike easily / linking it to the battery management system? check out http://www.terrafirmatechnology.com, also on ebay, they sell 3d printed batteries holder for greenworks 40v. i bought 2 to try, then eimmediately resold them and bough 4 more! before that i was just pushing spades into my tool batteries: i fried two in colorblindness.